Allied Vision has built up a strong portfolio of Short Wave Infra-Red cameras including new low cost models. With 7 models to choose from, it can be difficult to understand which model is best for a given application. 1stVision has made it a bit easier by breaking down the problem by reviewing several considerations which are identified below. Or if you simply want to discuss your application or want a quote, please contact us. If you are unsure what a SWIR camera can do for you, read this previous blog. Resolution: The first consideration is resolution which is available in VGA (640 x 480) or QVGA (320 x 256). QVGA is only available in the low cost G-008 model and provides the highest frame rates. Cooling: Cooled models employ an additional Thermal Electric Cooler (TEC) and fan which substantially reduces the the dark current and increases overall signal to noise ratios. If this is a factor, then the G-032 TEC2 Cool model is a good choice. 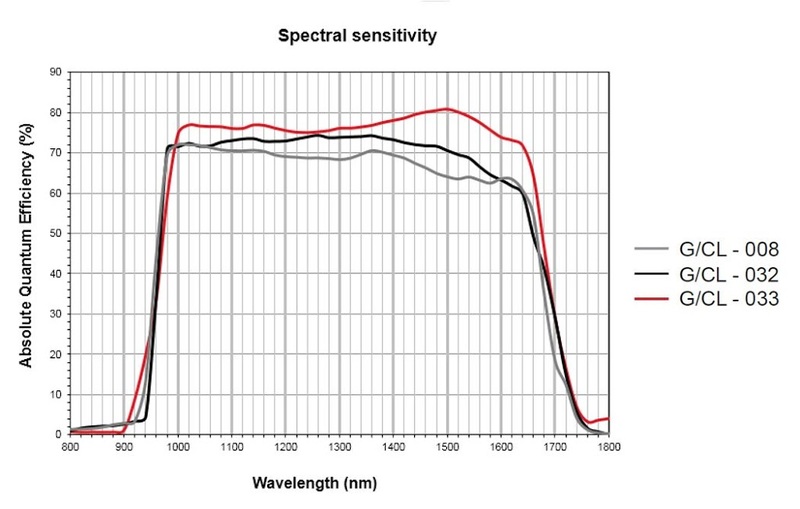 The chart below provides the thermal constant of the camera noted as DeltaTmax. This is the temperature difference from the case to the sensor. In turn, any additional heat sinking will further reduce the temperature of the internal sensor and noise. Frame Rate: Rates up to 344 fps can be achieved with the G/CL-008 QVGA model. The faster G/CL-033 will still achieve 301 fps with VGA resolution, but at a higher price. At a minimum, we can still achieve 100 fps with VGA in the G-032 models. (refer to chart below) For the highest frame rates, use the G/CL-033 in QVGA modes which will provide close to 1000 fps! Details specifications for each of the models can be found HERE. Interface: GigE Vision along with Camera Link interfaces are available, however the TEC2 cool version is only available in GigE. Camera link should be used if you need to be deterministic or if the full frame rate is needed at higher bit depths. The charts to the left indicate the achievable frame rates in 8, 12 and 14 bit modes using either GigE or camera link interfaces. As camera link provides a higher bandwidth, the full frame rate can be achieved in 12 bit mode versus a reduced rate using a GigE interface. 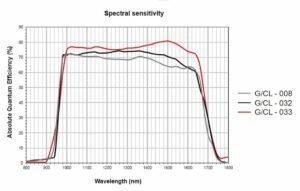 Sensitivity: The sensitivity chart below provides a good comparison between various models with the -033 model having the highest sensitivity. This is being driven by the image sensor in which the G/CL-033 has the highest quantum efficiency. Please do not hesitate to Contact us to discuss your SWIR applications. 1st Vision can provide a complete solution including cameras, lenses, lighting and cables. We have over 100 years of combined experience we can put to work for you! Previous PostPrevious What are the attributes to consider when selecting a camera and its performance? Next PostNext Learn about FUJI’s HF-XA-5M (5 Megapixel) lens series which resolves 3.45um pixel pitch sensors! Perfect for cameras with Sony Pregius image sensors.